We present a recipe a bit laborious but lovely with our organic white onion “sofrito” as a base for the sauce of this dish. Wash, peel and cut the mushrooms into slices not too thin, too clean robellones, lobster tails and basil leaves. Chop some garlic and parsley, heat a little oil in a pan, launches the garlic and parsley and mushrooms, add a little salt and stir then put three tablespoons of roasted onion and quiet. In the same pan, add a little more oil to the shrimp, dotted previously and then he made his point, foreign torraditas along with mushrooms. Put the basil you have previously cut, but nothing, four courts, is the big leaf. Two minutes turning and throwing spaghetti, you throw a pinch of white pepper and remove the black and all good. They have to brown a little, add the mushrooms with crayfish and juices. 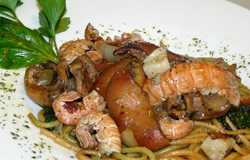 Serve with the spaghetti with prawns base above and mushrooms accompanied by a little chopped parsley.